If the item weighs more that a 1 LB. If the item weighs less than a 1 LB. I scratched off all stickers for the pics. Any and all residue that might be left is solely on the top loader - NOT on the card itself. However, I did not want to risk damaging the corners so I left the card in this loader. 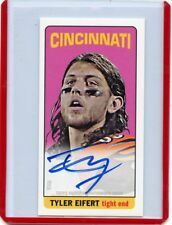 2013 Fleer Retro TYLER EIFERT #28 Autograph ROOKIE SENSATIONS! PSA 9 Mint Sharp! 2013 Fleer Retro TYLER EIFERT #28 Autograph ROOKIE SENSATIONS! THEY'RE BEING SOLD AS IS. Cards are as pictured. make Supersized seem small. YOUR LOOKING AT A 2013 PRESTIGE NFL PASSPORT ROOKIE CARD OF TYLER EIFERT. 2013 Panini Prizm Rookie Impact Wal-Mart Blue Prizms #18. 2016 Panini Football Foil #106. 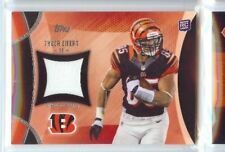 You are buying a 2013 Panini Rookies & Stars Jersey Autographed Rookie Card of Bengals Superstar TE Tyler Eifert. This card is Limited Edition serial numbered 211 out of 299. This is a great card of this superstar player. You’re purchasinga Tyler Eifert 2018 Playoff Parallel card. The football card shown in the images is theexact card you will receive. Details ontheTyler Eifert card can be found above and within the images. Up for a Buy-it-Now price are the assorted Tyler Eifert cards pictured. The cards are in excellent condition with four sharp corners. Tyler Eifert / Cincinnati Bengals. NASCAR Diecast. Sports Cards (All sports). U.S. & World Coins & Currency. (11)-295 Tyler Eifert (Rookie). (01)-039 Andy Dalton. 2013 Panini Prestige CINCINNATI BENGALS Football Team Set. These contain all base and rookie cards for the team listed (1-300). Cards average NrMint condition - Included players listed below.